Aqualoy A19 Marine Propeller shafts undergo more quality controls than any competing brand. These prop shafts are used in a wide variety of applications such as work boats, pleasure craft, naval vessels, and pumps. The Aqualoy® process produces a rounder, straighter, stronger shaft. All of our A19 shafts from 3/4" - 4" diameter are precision machined in our Mazak Nexus 350M CNC turning lathe to insure all machining is within .0005". All single tapered A19 stainless steel shafts will have a propeller taper machine according to SAE J755 specifications, unless other instructions are given. In addition to the propeller taper machining, a single square keyway will be machined for the coupling end of the shaft. The dimples for the set screws can only be machined with the coupling in place. If you purchase a coupling from us, there will be a $92.00 to fit and face the coupling to the shaft and during this process, the dimples for the set screws will be completed. 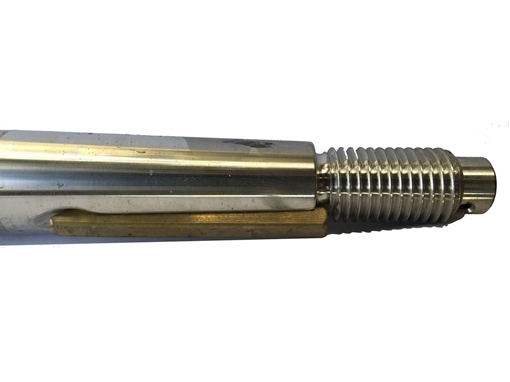 All double tapered stainless shafts will have a propeller taper machine according to SAE J755 specifications, unless other instructions are given. In order for us to machine the coupling taper, we will require either a drawing of the coupling taper or the following dimensions must be specified(as there is not an SAE standard for coupling tapers and these tapers do vary); length of taper, small end diameter of taper, and length and size of threads. Deep Blue Yacht Supply boasts a full service machine shop, with capabilities allowing for machining of stainless shafts up to 9” in diameter. As a testament to the master skill level of our machinists, many discerning yacht, boat, and facility owners across the globe have their A19 stainless shafts machined at Deep Blue Yacht Supply. Current lead time for the production of new custom A19 stainless shafts is 3-4 business days. Allow Deep Blue Yacht Supply's machine shop forge your new inboard propeller or pump stainless A19 steel shaft. We ship our stainless shafts across the globe, and you will not find better pricing. Order your new A19 stainless steel shaft today and save hundreds to thousands. Deep Blue Yacht Supply has one of the top stainless shaft machining shops out there. Each stainless prop shaft they've provided has been A grade. Would highly recommend Deep Blue for all of your stainless prop and pump shaft needs. 5 star stainless steel shafting and machining. Best customer support and machining hands down! Deep Blue yacht supply definitely has the best customer support for the whole process of measuring/buying/machining and shipping of your new drive shaft. The whole process was so painless thanks to Mike Heller vp of sales and marketing. Excellent job guys would recommend these A19 shafts to anyone! Very knowledgeable staff . Custom machine work done be them was done to the exact specs that they were given. Fast and professional, this purchase could not have gone smoother. super custom shaft. On time as promised!!! Just order it!!! You'll be glad you did. I will say that I grew up in a machine shop. My Dad was a Machinist in that shop for over 40 years. It's in his blood so much so that he bought one of the lathes and hired a crane to put it in his garage. And also has an xyz Mill. So he's still machining. The Deap Blue Yatch shaft I ordered was perfect. FLAWLESS. Keys, keyways, taper, threading... Spot on. Nice job. We received it pretty darn quick as well. Oh and pricing was even better. Pay for the fit and facing service if you're away from your home and your personal machine shop, it's worth every penny. I didn't. I fought that new split coupling and shaft for several hours, finally located a local Machinist and got it done. Great products. Super fast answers to questions... And there are no dumb questions. Thanks Mike !!! Oh I have ordered the whole left side of the menu with these guys. Top notch. Great prices, quick shipping, and excellent service, can't ask for more.